Christians know that after death there is a loving God who waits for them. This is not wishful thinking. Jesus did what no other person has done. He died on the cross and three days later He rose from the dead. His resurrection is the basis of our faith. Upon death each soul undergoes the particular judgment. Depending on the state of their souls, persons go to heaven, purgatory or hell. If a person does not go to confession for a mortal sin, they will not go to heaven. At the end of your life, Jesus wants you to be with Him forever. Don't sadden Jesus and die with mortal sin on your soul. Then you will be separated from Jesus for all eternity. Hell is final, but a soul in purgatory will eventually reach heaven… with prayers and God's grace. The final judgement will occur after the resurrection of the dead and the reuniting of a person's body and soul. Then Jesus will come in all His Glory with His angels and the Saved will enjoy eternal life with Jesus. The good news — Jesus is always ready to forgive our sins and to help us change our life. In Luke 24:43, Jesus turns to the thief hanging on the cross and promises: "Amen I say to you, today you will be with me in Paradise." Our Lord has promised, "In My Father's house are many mansions: If it were not so, I would have told you. I go to prepare a place for you." The Mother of Jesus has promised... that anyone who faithfully recites the Rosary will receive at the hour of their death, all the graces necessary for salvation. 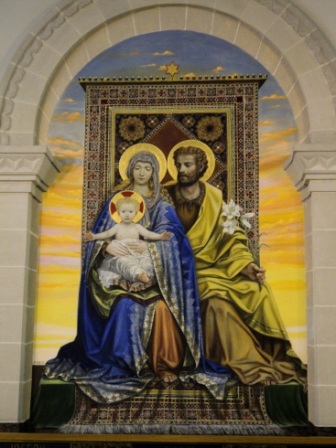 When The Lord calls you home... pray and ask Jesus, Mary and Joseph to be with you. Silently whisper, "Jesus I trust You." One short sleep past, we wake eternally, and death shall be no more.